MHCM exhibits and gallery spaces are 100% screen free. We know that young children learn best by relating to real live people, and that they also learn by moving and doing. With this in mind we intentionally develop our exhibits to be age-appropriately tactile and interactive without added media. Extensive research shows that “screen time” detracts from children using their communication skills. Without practicing their face-to-face interactions, children may lose their ability to evaluate emotions as well. Newer studies focusing on parent smartphone overuse point to detrimental impacts on social, emotional and behavioral development in young children. When visiting MHCM we ask that you use your smart phone only to capture photos/videos that document important moments with your child – but to please NOT “check out” on your smartphone. Not only are responsible for supervising your child at all times, you are your child’s first and best teacher. Early Learning Junction (ELJ) is a special gallery space in the museum because it was designed specifically to encourage the development of school readiness skills in children ages 4 and under through play. Play Cultivates Independence – Let your child take the lead! 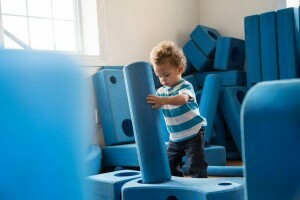 For a toddler, having freedom in their play is a great way for them to explore their independence and grow. Don’t be surprised if your toddler wants to repeat the same activity over and over or only wants to play with one thing – that might be just what he or she needs. Play Develops Gross Motor Skills – ELJ is a great place for toddlers to develop physical coordination and confidence moving around. There are tunnels to crawl through, small ramps and ladders to climb and beams to balance on. They are safe but not completely risk-free. Just like in the real world, there is a small danger of bumps and bruises from falling down that’s all part of the learning self-awareness. Play Builds Social Skills – As you know, toddlers are naturally very self-centered. They are still far too busy figuring out their own needs to worry much about the needs of others. 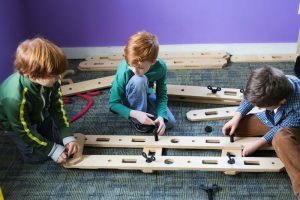 The large train table allows children to have their own space even as they begin to interact and share with other children. These beginning steps towards playing with others are important to their emerging social skills. Play Stimulates the Senses – Your child is learning by using his or her five senses. Your child might delight in the sounds of crashing cars or falling Plinko chips. They might feel the air through the scarf tubes or the various textures in the station. Visually tracking the scarfs as they move through the tubes or the cars as they zip down the track helps to strengthen and coordinate eye muscles and nerves that will one day be used for reading. Play Builds Language Skills – Children tell elaborate stories using props. Encourage this. Also, be sure to explore the News Stand Reading Nook and read with your child. Reading to your child every day will help him or her become comfortable with books and be ready for reading. As you read, point to words and pictures on the page and occasionally ask your child questions about the story. The giant blue building blocks on that pop up from time to time on MHCM’s first floor are part of an exhibit called Imagination Playground. Imagination Playground was designed by New York architect David Rockwell as a way to bring more open-ended play to traditional playgrounds. Spatial Reasoning – As children build with blocks they must think about how each block would fit if rotated at various angles. They also think about sizes and distances, which challenges them to figure out how to make the objects balance. This helps their brain practice spatial reasoning skills. Math – Numerous studies show a link between block play and math skills. One study by Wolfgang, Stannard, and Jones in 2003, even showed that the complexity of building block play at age 4 could predict achievement in math tests later in life. Social Skills – Not only must children share the materials, they must communicate what they are doing and resolve conflicts. Problem Solving – As your child builds they are likely to run up against various challenges. Because there are different ways to solve each building problem, blocks provide great practice in finding creative solutions. How can a parent best support learning in Imagination Playground? Let the child take the lead! This is their time to stretch their imaginations. Pretend that you are simply their building assistant. Stumped on what to build? Start simply putting one piece on top of the other or connecting them with the tubes. As blocks are layered on you will be able to make statements such as “This reminds me of…” Use those conversations to guide your building! Please respect the space. Keep blocks on the ground or on top of another block. Encourage productive teamwork and discourage activity that might lead to knocking down other’s structures and using the blocks for sword fighting. Imagination Playgrounds’ website has a nice summary of recent research on block play. The Science Center @ MHCM is an innovative learning space, specifically created to support and advance early STEM learning in young children. “STEM” refers to the integration of science, technology, engineering, and math. It is never too early to have young children investigate STEM concepts and content. This type of exploration helps young children develop the critical thinking and problem-solving skills needed to make sense of the world around them and to succeed in school and in life. Make it fun! Science and engineering at an early age is all about exploring the world. Encourage your child to use their senses, try things and make their own discoveries. Point out that math is everywhere – There are simple ways to make math awareness part of your daily routine. Finding things to count with your child, pointing out shapes in the world around you, and comparing the size of different objects are all ways to keep math central to your child’s life. Use real science words – Your child will likely run into words like “predict” “observe” and “experiment” later in elementary school. Using these words now will help them get a jumpstart on the vocabulary in a meaningful way. Be mindful. How you talk about science and math – especially if you didn’t enjoy these subjects yourself – conveys strong messages. Young children pick up on vibes and this can prevent them from becoming confident learners. Be comfortable not knowing the answer. This gives you opportunity to explore a subject area in depth…together with your child. Make a prediction or hypothesis. Ask your child what they think will happen. Why do they think that? Experiment! Try it out. Do it a couple of times to be sure. Talk about what you see and notice. Talk about what happened. Was your prediction right? How do you know? How could you make the experiment better? Can you make any conclusion? Link, Lift, Launch! challenges children to solve problems by collaborating and building. How can parents and caregivers support learning in this space? What are you trying to build? What might be hard about building it? Brainstorm possible solutions. Talk with your child about what they think they should do. Identify a couple of options of how to do it. Then evaluate which seems like the better option. With older children, you might sketch out our plan as a drawing. But with young children in the museum, try laying out materials you will need and then talk about the ways they could be put together. Build your creation and then see if it works the way you wanted it to. This may be the most important part of the process for young children. Engineers do not just call it quits after their first prototype. They inspect their creation and figure out what they can improve to make it better. Sometimes the whole engineering process repeats itself – and that is good!